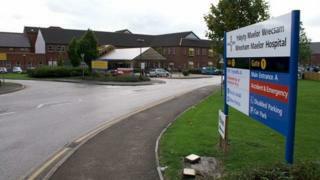 A dementia sufferer from Denbighshire died after she walked out of a hospital ward and fell, an inquest has heard. Iris Hughes, 80, of Llwynmawr, Llangollen, was escorted back to Wrexham's Maelor Hospital by a police officer an hour after walking out. But a jury inquest in Ruthin heard she had probably fallen in the car park, causing brain damage from which she died less than 24 hours later. Mrs Hughes, whose dementia had worsened over the past seven years, was made subject of a Deprivation of Liberty Safeguarding procedure to protect her. She was given one-to-one care while on Morris Ward but ward manager Sharon Jones told the inquest that she decided to withdraw it because Mrs Hughes was mobile and less confused. Mrs Hughes went missing that night - on 29 September, 2015 - shortly after her son had visited her. She was checked at regular intervals after returning to the ward, but at about 07:30 BST she was unresponsive and her condition deteriorated. Sharon Thomas, nursing director for secondary care with Betsi Cadwaladr University Health Board, told the hearing a serious incident review had been held and the Health and Safety Executive investigated. As a result, a policy was being introduced across the region regarding one-to-one care whereas none had existed in the past. She said staff were also to be trained in responding to missing persons and a swipe card system was being introduced to exit some wards as well as gain entry. Mrs Hughes' son Stephen told the hearing he could not understand why it had taken 13 months since his mother's death to make such improvements. John Gittins, the coroner for North Wales East and Central, said he shared his concern but would delay issuing a Regulation 28 notice after hearing procedures were being tightened up. "This cannot be allowed to happen again; it is far, far too serious," Mr Gittins said. After the inquest Gill Harries, the health board's executive director of nursing, said: "We have made a firm commitment to him that the policies will be signed off and implemented by the end of this month."